Goodell made the comments a day after the NFL's annual meeting. NFL Commissioner Roger Goodell said that he and other team owners "believe everyone should stand for the national anthem" but left the league's policy about asking players to do so unchanged. Goodell made the comments in a press conference Wednesday, one day after an annual meeting in which owners and players met at NFL headquarters in New York City. The NFL owners met separately this morning, where they "spent a great deal of time talking" about the issue and why the players should stand for the anthem, calling it an "important part" of the game. "It's also important for us to honor our flag and our country, and we think our fans expect us to do that, so that is something we continue to focus on this morning," Goodell said. Earlier, Goodell said owners at the meeting "did not ask" players to stand during the anthem, instead focusing on ways they could make communities better. "We spent today talking about the issues that players have been trying to bring attention to –- issues to make our communities better," Goodell said." I think we all agree there’s nothing more important than trying to give back to our communities and make them better. That was the entire focus of today." President Donald Trump took to Twitter this morning to lash out at the National Football League's decision not to force players to stand for the national anthem, reacting to Goodell's announcement on Tuesday that the league would leave its current policy on the issue unchanged. The president tweeted, "The NFL has decided that it will not force players to stand for the playing of our National Anthem. Total disrespect for our great country!" Goodell defended the league in response to Trump's criticism, saying that "players are not being disrespectful" when they protest, but emphasized that he wants to "get back to football" and "stay out of politics." Former San Francisco 49ers Quarterback Colin Kaepernick started the movement more than a year ago by refusing to stand while the national anthem played before games to protest police brutality and racial inequality. Since then, athletes across the country and even around the world have joined in the protest. 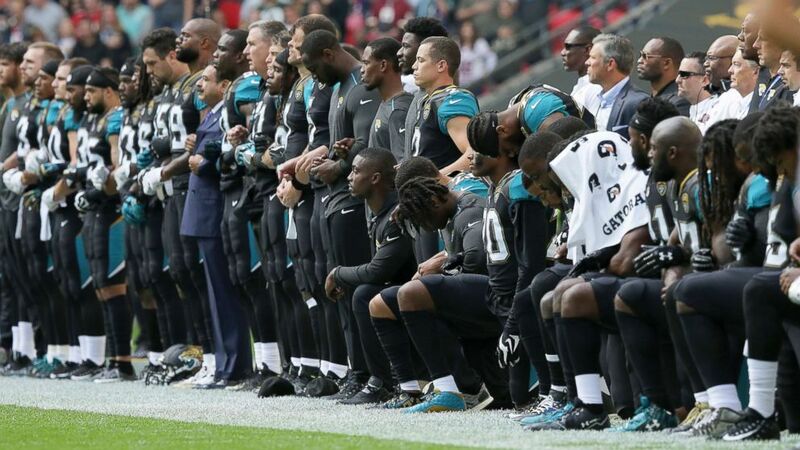 (Tim Ireland/AP) Jacksonville Jaguars NFL football players are shown, some standing and some kneeling, during the playing of the national anthem at Wembley Stadium in London. Kaepernick, now a free agent, recently filed a grievance against the NFL, alleging the league's owners colluded to keep him out of the league because of his protest actions during the national anthem. The grievance alleges the owners "colluded to deprive Mr. Kaepernick of employment rights in retaliation for Mr. Kaepernick's leadership and advocacy for equality and social justice." Kaepernick was not invited to attend the league's quarterly meeting Tuesday, where the national anthem policy was discussed. But Kaepernick's attorney, Mark Geragos, told ABC News "he absolutely should have been." “Certain elements, especially the executive branch, have hijacked this and tried to make this an anti-military or an anti-flag [issue], and that’s not what it is. He’s said from day one that this is about giving rise to social injustice and focusing on social injustice," Geragos said in an interview this morning with "Good Morning America" anchor Michael Strahan. "Unfortunately, people want to change the paradigm so to speak or shift over the discussion to make this anti-American; it’s anything but," Geragos continued. "It’s pro-American, it’s trying to make America exactly what it's supposed to be."